Body time. I usually start by brushing all the dust out of the nooks and crannies of the trem. This would also be a good time to wipe surface buildup off the trem itself, it's far out of the well and you have decent access to the sides. 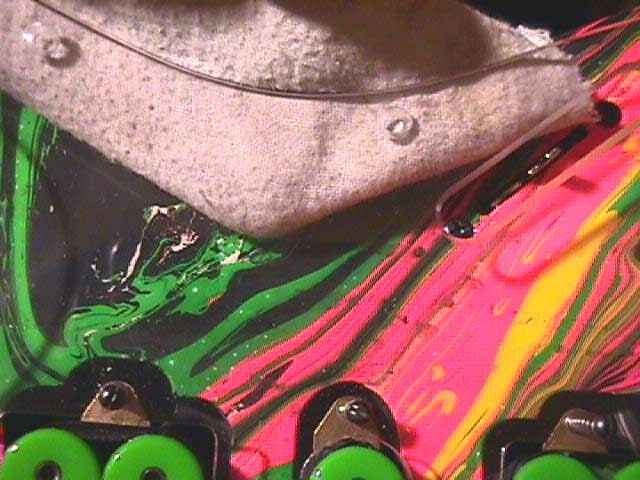 Your clean rag damp with spit works the best on hardware. 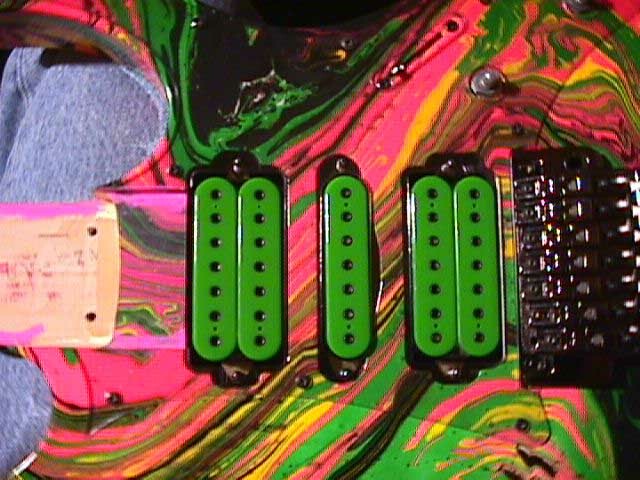 (This guitar is odd in that the trem was extremely low in the cavity when I started, so low it had cracked the clear under it. 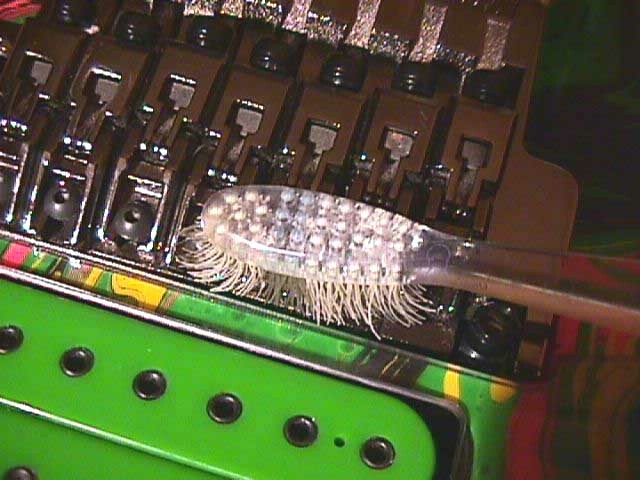 I had the trem out earlier to analyze the problem and cleaned it completely at that time) Removing the fine tuners to clean the flat between them is a nice touch, but using the toothbrush works in a pinch. I removed these. Clear pickguards, gotta love them. Everything from spilled beer to Cheeto's crumbs find their way behind there, including lots of atmospheric crud. Everything is usually stuck like a rock too. This one's fairly clean for having never been done, but far from *clean*. 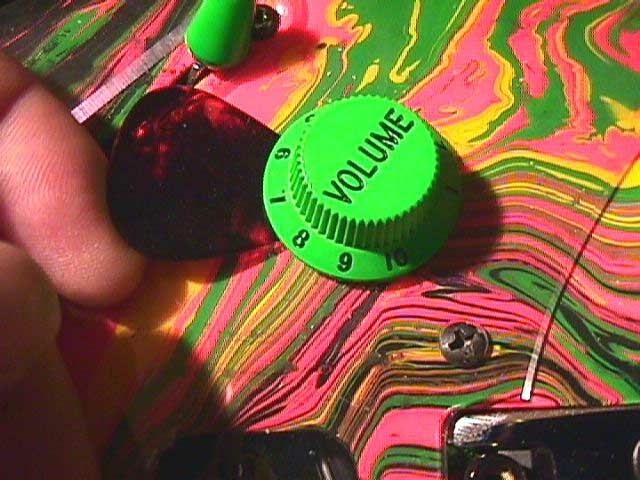 First off remove the knobs and switch tip. 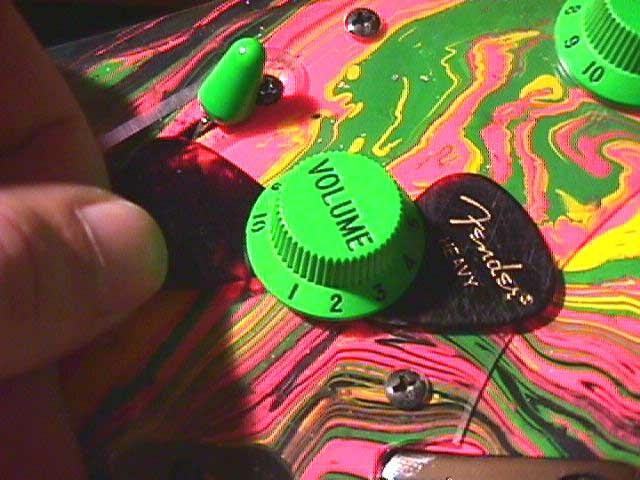 Wedge a heavy pick under one side on the knob and spin the knob. This will give you enough clearance to get a pick under the other side. Work them back and forth and the knob will slip right off. If you're worried about scratching the guard with the pick [yes, it will if the clearance is tight] stick a piece of tape next to the knob where the pick will make contact, Scotch or masking, no matter which. The clearance wasn't that tight on this knob for me to worry about it. The switch tip will come off with your fingers if it's been off before. If it hasn't the chances are you'll need to use a pair of pliers. 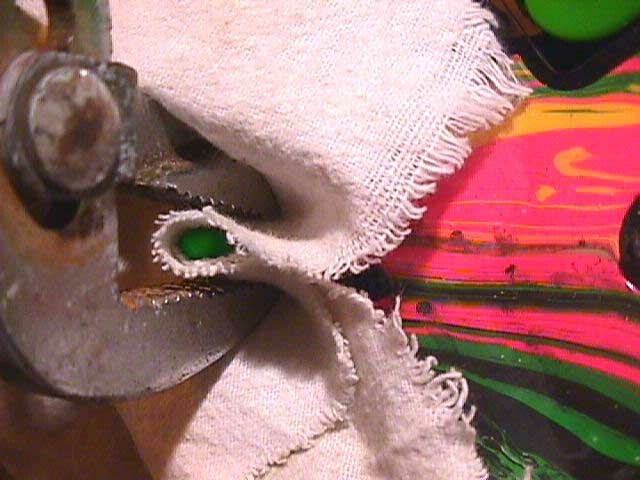 Use your rag to protect the plastic and only squeez hard enough to grip the tip. I'm using channel locks to get the right jaw opening, pinching more underneath the tip. Remove the pickguard screws now, organizing them so they go back in their original holes, wear pattern. The first time a guard is removed you'll hear it cracking as it seperates from the clear, it's actually lightly glued on by the freshly sprayed and ultraviolet cured clear when originally assembled. I've pulled 3 month old DNA guards that cracked. There's actually nothing 'cracking', but that's the sound it makes as the guard releases. UVMC's have guard mounted pickups so you can only lift the guard so far to work underneath. GMC's, PMC's, and most FP's have direct mounts so the guards come right off. The best cleaner to use under the guard? SPIT! ;-) Don't use your cleaner wax, getting the trails of oil smears out from under it is a huge PITA. You don't want to rub too hard as even a clean rag can leave light scratches in the underside of the guard. Also be careful to not break the guard, it's very narrow and weak in several areas. 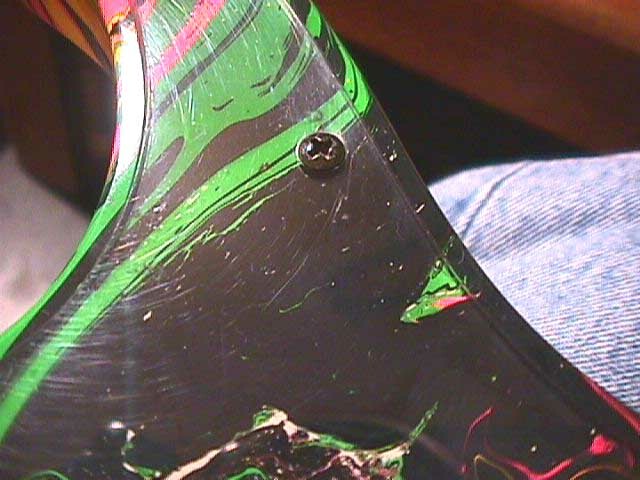 Use care as you hold it wedged off the body as the pickup screws are SHARP and you can easily scrape them on the clearcoat if you're not careful and observant. Nothing like a nice scratch under a clear guard. 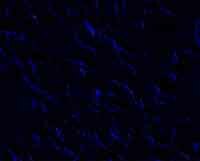 You might not see it, but I will. You'll have a lot of fun cleaning the rails that run between the pickups!! LOL When you're done wipe down the tops of the pickups. On every clear guard there will be areas underneath that will just not clean or polish, you'll find these on the clearcoat under the guard too. This is where the guard and the clearcoat have been in contact and over years the remaining solvents in the clear etch the pickguard, and the pickguard from contact makes the clearcoat matte finished. This can be machine polished if you remove the guard. The guard off also makes for easy 'complete' cleaning, but removing the guard without cutting the p/u wires requires removing all 6 p/u screws, much easier getting them out than it is to get the p/u screws rethreaded with the springs fighting you. If you go for it seek help! ;-) As soon as you're satisfied with your efforts screw the guard back on. 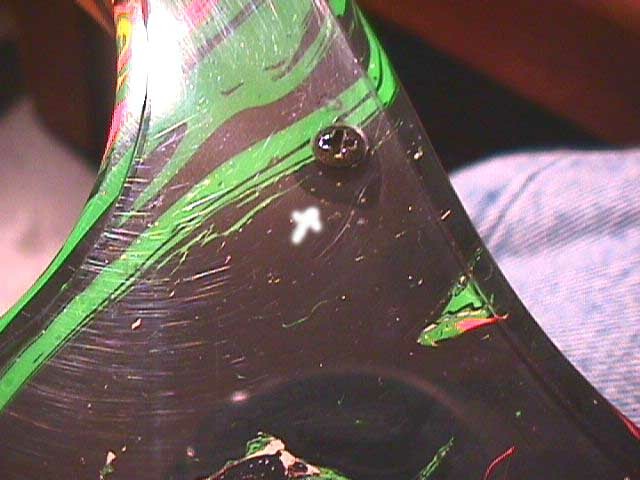 If you tighten the screws you'll notice really dark, clear, shinny, oily spots around your screws. This is where the guard is in direct contact with the clear. Just back the screw off till you see it disapear. It's as good as it's going to get, time to reassemble.